Hi guys! Just getting this post in before midnight, haha. I had a lazy day and only just did my mani for today. But again, I made it super cute, so it was worth the wait! Before we get started - the Bundle Monster Facebook nail art contest ends soon! Click here to check out my entry and give me a vote if you like my design. You guys helped me win before and I know you can do it again! I totally appreciate it! I've been waiting to do a splatter mani for a while now, but never took the time to do it until tonight. I thought an all-pink splatter might be nice! Pink overload! In a good way! I'm so happy with how this turned out. The base is, as you know if you've been following this challenge, Color Club Peppermint Twist. To acheive the splattered look, I dipped a coffee stir stick into a drop of polish and quickly blew it over my nails. There are several tutorials for this on youtube - check it out! It's super easy. No nail art skills required! I'm so happy with the way this turned out and I'm not looking forward to changing this manicure tomorrow to keep up with the challenge! That's the problem with these challenges... Haha! One of my lovely followers, Line, who I've been interacting with on my Facebook page suggested I do a pink manicure for breast cancer awareness this month. I've been doing pink all week as you know - but today I decided to add a ribbon to really seal the deal! I added the ribbon with China Glaze Urban-Night. I hope this breast cancer awareness mani hit the spot, Line! Line has recently started her own blog too (it's contagious,) but it's in French so many of you may not understand. But you can all look at pictures! Check it out here. And again, check out the other manis from the girls in the challenge this week! Good evening! I just did my nails for today so I'm posting them a bit late. They're not the most well done but I really like them! Ages ago, I saw a picture on tumblr of gray nails with a neon pink tip. It's been in my mind to do ever since, so today is the day! It's not the neatest up close but from a distance it looks great! The pink is, again, Color Club Peppermint Twist. The gray is China Glaze Recycle. I did the thumb differently as an accent nail. I stamped the bow image from Konad m59 with Peppermint Twist but it didn't stamp opaque enough - so I used a detail brush to fill it in. It looks a bit messy but I actually sort of link the imperfect look of this nail. I got it from Forever 21 and I am in love with it. Of course it needed a nail dedication. As always, check out the other posts from the challenge ladies today! Hello and welcome to Day 2 of the Nail Polish Bloggers Challenge! Today begins the real challenge - creating six different manicures using the same polish. For my first attempt I decided to use a new plate I got which I have been wanting for a long time! 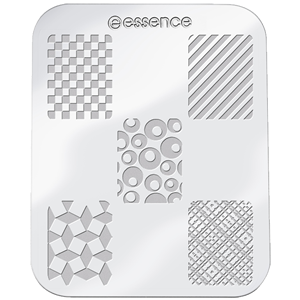 This is an Essence Stampy Plate. I mentioned back in September that I had been trying to get my hands on this plate without success! Not long after, it was reader to the rescue! A lovely girl named Steffi emailed me telling me she had bought the plate for me. How sweet is that?! Thank you so much, Steffi! I appreciate your generosity very much! Seriously, you're great. Ah! Pink checkered nails! My dream! I've done this before using a Sharpie and sometimes tape but it is just too time consuming and not perfect enough for my liking. Full of awesome. I have such a "thing" for checkered stuff. As you know, my base color is Color Club Peppermint Twist. I stamped from the Essence plate using Wet N Wild Black Creme. I hope you guys enjoyed these nails! Do any of you have a thing for checkered stuff like I do? And again, check out the other bloggers involved for more great pink posts! So I was not planning on getting it... But I opened the tab when there was only 11 seconds left in the auction and no one had bid so without thinking I snatched it up!! Oh well, this color is gorgeous and I'm happy I bought it, even if I didn't really mean to. Haha! China Glaze - Drinkin' My Blues Away. This is 3 coats of blue jelly glass-flecked shimmery goodness. It really looks watery and pretty, and the shimmer even flashes some pink and purple! This impulse-buy was a good purchase. That ends my little series on older China Glaze pretties! Maybe some day I will have a few more for you.